Ashtray or cup holder depending on the veee-hickle. 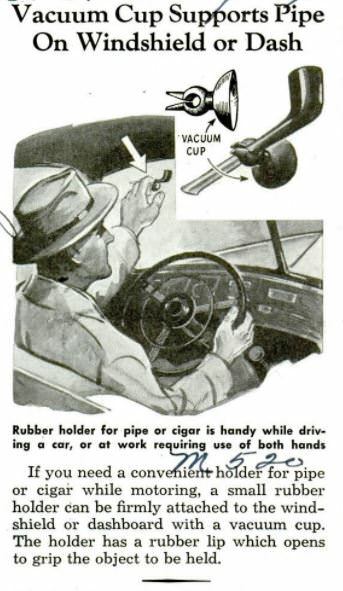 [quote]Put a square of leather in the ashtray, rest the pipe on that. I like that, KISS at its finest. Thanks. Anyone have any good ideas for a vehicle mounted pip holder on steel? I am thinking something magnetic might be doable. Yes, a simple open pouch with a couple of magnets sewn/glued in/on would do nicely. Maybe self-sticking Velcro dots/squares -one on the pipe, and one on a car surface.... might help? Stick the pipe down and then peel it off the stationary/mounted dot. Michael, that's a great looking R. Scarlatta you have there! How do you like it? I have two of his pipes and both are solid smokers. Here's a magnetic mount, they are all over ebay, in various designs. Most have clips to hold the pipe in place. Another magnetic mount. But @mahew, I'd think twice before putting a magnet on that beautiful painted dash! Forum member Mayfair made a leather strap you can attach that's pretty cool. He sent me one and it works great. Search his post from a couple of months ago. I like the pouch idea for other reasons and I think I will make that happen. I am not so sure about that idea for the pipe itself. I have visions of something I could set a lit pipe in. I have a very strong magnet set in a base with a 1/4-20 thread in sort of a “t” shape that I could do something with. I could maybe attach a wood base to that. Not sure how secure that would be in a somewhat bouncy truck though. The dash paint is not original, and isn’t really all that great (one day I will completely restore it). I can protect the paint with a felt lining if the magnet is strong enough. I like the idea of clips to secure the pipe, I didn’t think of that. I will check out the leather strap. Thanks for the great ideas! 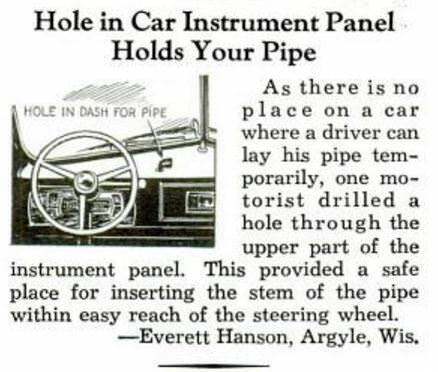 A suggestion from 1938, just drill a hole in your dash! Broken cupholder on passenger seat. I was hoping for some type of clip device. Not much exposed metal in my vehicle. Tuold, I hadn’t thought of that. You have just made the solution to my situation stupid simple! A bit of 1938 know how, seems a fitting alteration for a 1950 pickup. I have an unused existing hole that I can enlarge a bit, and a simple rubber grommet that I can get from work should keep the pipe fairly secure. A support clip for a u-bent t8 or t12 fluorescent lamp may be easily modified for your application. Usually they are made out of spring steel, and some have a plastic coating that would prevent scratches. Designed to fit a 1 inch (t8) or 1 1/2 inch (t12) round lamp. Michael, that's a great looking R. Scarlatta you have there! How do you like it? The dublin smokes like a champ. I highly recommend his pipes. It has a steel tubing reinforcing the pencil thin shank, so you can feel confident that it won't just snap like a twig. 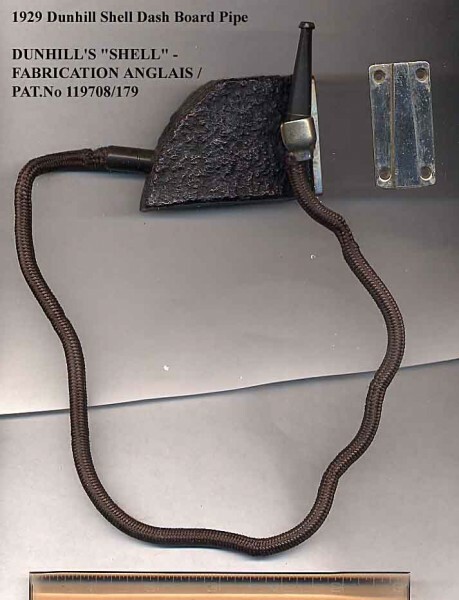 The other was made by Dan who is featured in the latest Pipesmagazine article. It's quickly become a solid member of my goto rotation. This thread from another forum has a picture of a Decatur Car Boy, if you scroll down a few posts. It uses two rubber grommets at each end of the wood block to hold your pipe in place. I have one. I have a rack mabe by then that holds 36 pipes using the grommets. Just stick the stem in the grommet. Three years later there was this solution. Maybe one like this can be made from a cell phone holder and a clothespin. I just get ashes all over the passenger seat. Adds to the 99 other reasons to get a rise out of my wife. I had only looked on one site. I think it was tobaccopipes site that I found two options. Bought them both, they were relatively cheap. One was similar to what was previously shown on this thread with a magnet on the bottom. We’ll see how they work.